Hmmmm. Really?! I guess we shouldn’t really be surprised. 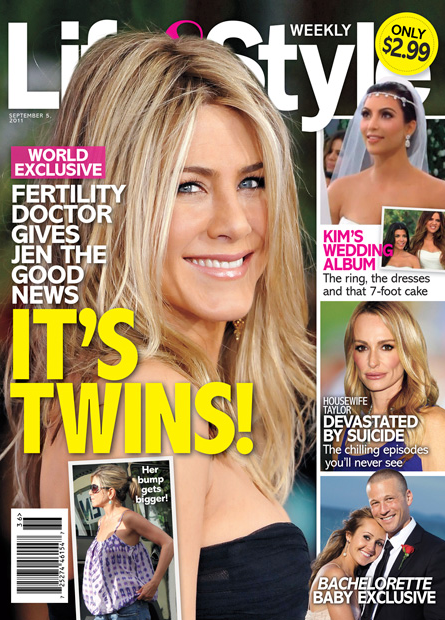 We know that Jennifer Aniston has been itching for a baby for a long time and she;s running out of time. She’s allegedly been going through fertility treatments and they’ve paid off. She’s reportedly pregnant with twins. That is very common, to have twins when you are on fertility drugs. But wow. It’s kind of hard to picture Jen changing poopy diapers and doing the whole mom thing. So I wonder how Justin Theroux is feeling? If this report is accurate, he went from a long term relationship (14 years) with Heidi Bivens, to being in a head over heels one with Jennifer, and now expecting twins. What a life change. If this is all true, I am very happy for them…. so here’s an early congrats! while we wait for confirmation…..stay tuned.